A few months ago we had dinner at a friends house. She was dabbling in the Keto diet and served these Cheesy Keto Biscuits. I wasn't sure what to expect, but they were DELICIOUS! Chicken Legs went crazy over them! He couldn't stop eating them. I snagged the recipe from her so I could make them at home. Now, these are not low-fat or low calorie biscuits. They are LOADED with TONS of cheese. Cream cheese and mozzarella cheese. The only special ingredient in these Cheesy Keto Biscuits is Almond Flour. I actually think almond flour is pretty common these days. I got mine at Walmart. I used a 12-inch skillet and a large cookie scoop and got 16 biscuits. If you don't want individual biscuits, I think you could just put the dough in the skillet or baking pan and make a loaf of bread. I like to brush the cooked biscuits with some melted butter and garlic powder. 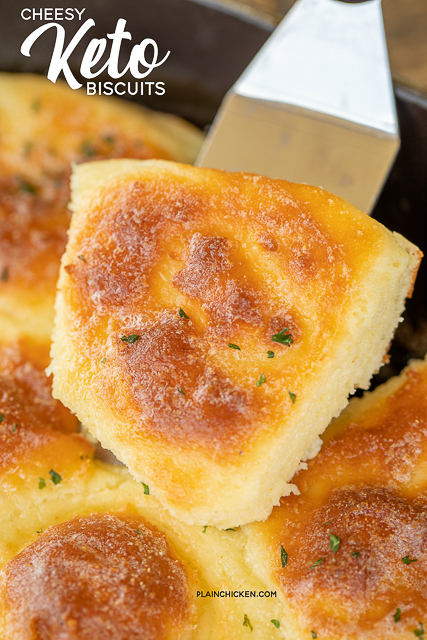 Even if you aren't doing the Keto diet, these Cheesy Keto Biscuits are sure to please! We've made them several times and enjoyed them every single time!! They are great if you are doing a low-carb diet and missing bread! Preheat oven to 400ºF. Spray a 12-inch cast iron skillet with cooking spray. Set aside. In a saucepan over low heat, melt the cream cheese and mozzarella cheese together. Stir until smooth. Remove from heat. 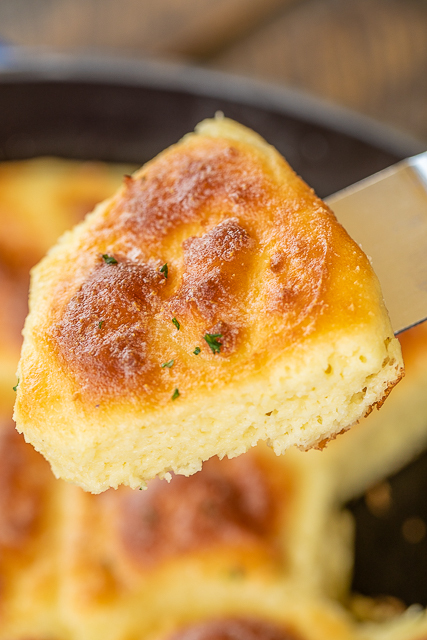 In a large bowl, combine the melted cheese, eggs, 4 Tbsp baking powder, and almond flour. Mix until smooth. Let stand for 10 to 20 minutes. 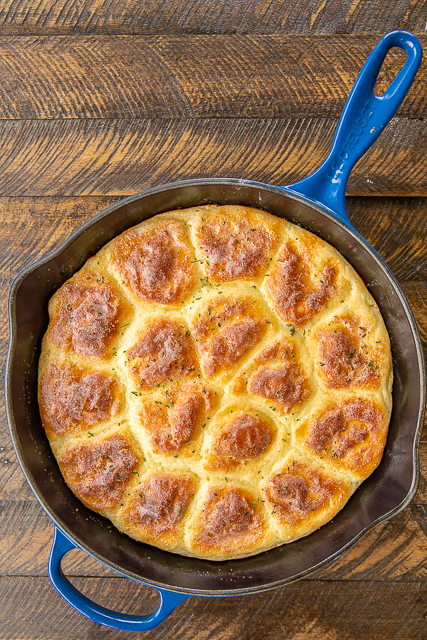 Using a large cookie scoop, scoop dough and place in 12-inch cast iron skillet. Place skillet in refrigerator for 10 minutes. Remove skillet from refrigerator. Bake for 20 to 25 minutes, until golden brown. 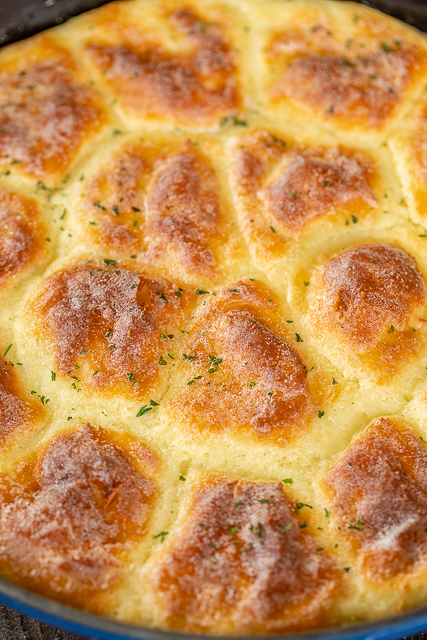 Brush cooked biscuits with melted butter. 0 Response to "CHEESY KETO BISCUITS"